The Israel Police and General Security Service (Shabak) yesterday announced the capture and arrest of a crime and terror cell from the Bedouin town Bir Hadaj in the Negev. All five suspects were charged with damaging IDF security installations on the Israel-Egypt border to facilitate drug-smuggling operations. The Regavim movement for protecting Israel's resources issued a statement about the operation: "Bir Hadaj has long been the capital of crime and drugs in the Negev. 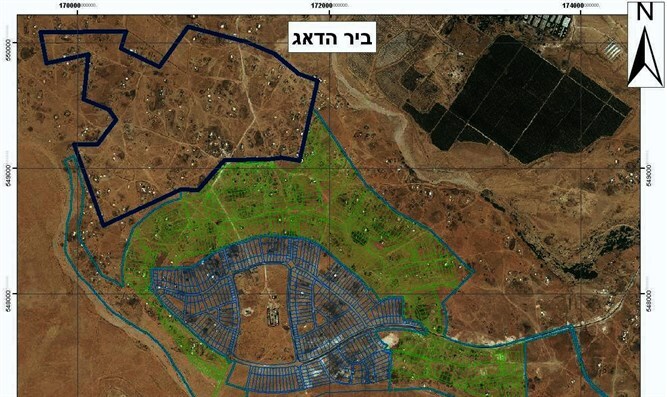 The bands of marauders who infiltrated the IDF base at Tze'elim, stealing everything they can get their hands on - from weapons and ammunition to the personal belongings and private cars of soldiers serving on the base - come from nearby Bir Hadaj." The hothouses that sprung up on the training grounds at Tze'elim where an established crime family from Bir Hadaj grew cannabis were exposed by Regavim's hidden camera. The group reports the vandalism that battered nearby Kibbutz Revivim also originates in Bir Hadaj. Regavim also stresses that most of the houses of Bir Hadaj were built illegally, on Jewish-owned land that was seized by force. "The lawful owners of the land, represented by Regavim's legal department, petitioned the District Court as well as the Supreme Court, but their land has not been returned to them," Regavim said.